As final exams approach, most students will take every measure available to boost their grade in the last weeks of school. Finding seats in the library feels like a game of musical chairs, desperate students resort to pulling all-nighters, and those with access to prescription stimulants sell their excess pills with ease. According to the Canadian Centre on Substance Abuse (CCSA), stimulants are typically used to help those with attention deficit hyperactivity disorder, or ADHD. These drugs are labelled under different trade names, such as Ritalin, Concerta, Adderall and Vyvanse. While prescribed in varying medical contexts, these drugs all increase dopamine levels and make it easier to pay attention. 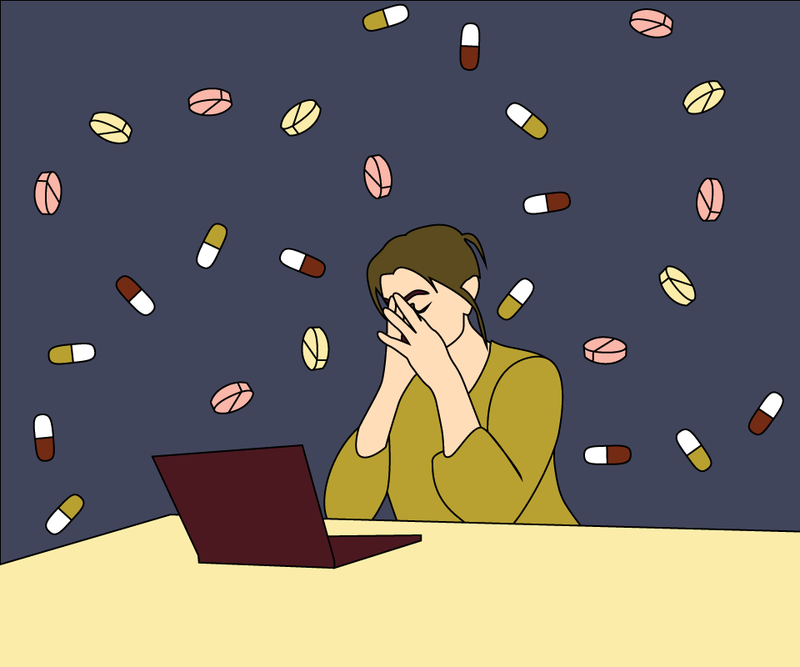 While the drugs were originally created in part to treat ADHD, prescription stimulants have become more mainstream since students started using them to improve their studying habits. Students report increased awareness and longer attention spans when on these prescription drugs, allowing them to complete assignments or study at a quicker pace. In 2017, Statistics Canada conducted a general population survey on drug use amongst Canadians. The data found that 2 per cent of Canadians over the age of 15 used a stimulant in the past year, and 6 per cent of those who reported using a stimulant were between the ages of 20 and 24. Of the original 2 per cent who reported stimulant use, 19 per cent were Canadians over the age of 15 who also reported problematic use of stimulants. Within the 19 per cent of those who reported problematic use, 41 per cent were between the ages of 20 and 24. This statistic represented the highest amount of usage of all age ranges studied. This age range also encompasses the majority of university students. While students may use prescription stimulants as a “cheat” for their studies, they may not be entirely at fault. Some students blame their use of drugs like Ritalin or Adderall on unrealistic scholarly expectations set by universities and CEGEPs. A single three-to-four hour final exam can range anywhere from 20 to 70 per cent of one’s final grade. Most of these exams are also cumulative, meaning students may be questioned on any material they’ve learnt since the beginning of the semester. In many cases, this includes over 20 lectures, dozens of PowerPoint slides, and hundreds of pages of material. While study drugs may not have immediate side effects, long-term effects can be very damaging. Through frequent use, the effects of the drugs diminish and cause users to increase their dosage. According to the CCSA, long-term users can quickly develop a dependence on stimulants, which can lead to increased irritation and paranoia, among other things. Author’s note: Due to the sensitive nature of this article, interviewees will remain anonymous to protect their identity.